A major service we provide clients is helping them navigate the maze of insurance coverage. And one of the hardest things to do is tell clients we’ve hit a dead end when the coverage runs out. Why would that happen? Because Arizona state law only requires a person to have an insurance policy with a minimum of “15/30/10 Liability.” These were the levels legislators thought were appropriate when the law passed 46 years ago. What does that mean? Well, the liability part means it is coverage to protect OTHER people from the policy holder. It doesn’t pay to help the policy holder’s injuries or the policy holder’s car. So if someone with state minimum coverage blows through a red light and T-Bones you, their insurance will NOT be paying anything to them. Let’s see how it would cover you. In a 15/30/10 liability policy, the “10” is $10,000 to cover property damage in the accident. This includes damage to your vehicle, personal property, rental charges, diminished value of your vehicle, and any other property damage (like if a someone hits a fire hydrant or light pole and the city wants to get repaid). When these limits were set in 1972, $10,000 would go a lot further. For example, here is a 1972 Mach 1 Ford Mustang. According to NADA, when this car was new it retailed at $3003. So, with the original property damage minimum limits you could plow through three of these babies like the monster truck in the first image and total them all without exceeding the cap. But as cars have grown safer they’ve also become more expensive. Think about your car: how much would $10,000 fix? Each airbag that went off is a few thousand to replace before we even talk about body damage and paint. And if that is exhausted, there is nothing left to compensate you for your lost resale value either. Or if your car is worth $15,000 and is totaled, you are going to be short at least that missing $5,000. Back to the original example, a base model 2018 Mustang has an MSRP of $25,585. If it were totaled that would be $15,585 of value uncovered by minimum limits. 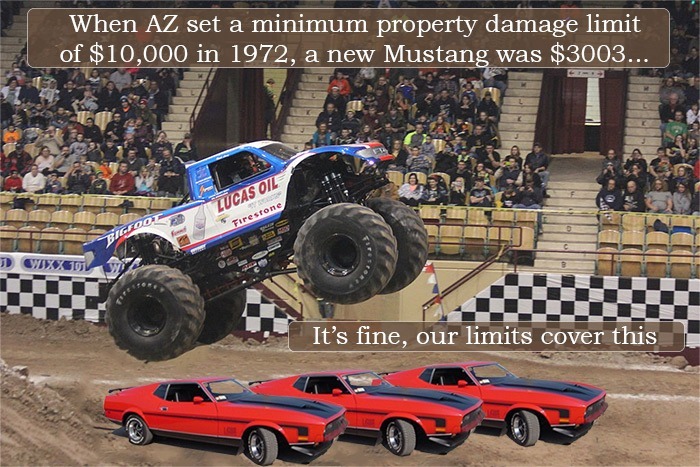 So the limits set in 1972 that would cover 3 new Mustangs now only cover about 40% of one. If the original intent of the minimum coverage was to safely cover the damages to someone’s vehicle, damage to other property, and the victim’s rental car costs, $10,000 is no longer sufficient. The costs of medical treatment after an accident are also hard to cover with the current minimum limits. The other portion of a 15/30/10 policy pertains to bodily injury. 15/30 refers to the money that covers other people’s injuries in the accident. There is a $15,000 dollar limit on each individual’s coverage. So if this person runs the red and hits you, the most money his insurance would pay towards your medical bills, pain and suffering is $15,000. What is the 30? The 30 stands for the $30,000 limit for everyone (besides the policy holder) injured in the accident. Was it you and a friend hit? Great, you can each get all of that minimal $15,000 injury coverage that probably won’t cover your bills, hurray! But were you and two friends hit? Bummer, that means instead of $45,000 paying for your injuries, you all split the $30,000 getting maybe $10,000 towards each of your bills if they’re roughly the same. And was there another car involved? Well, unfortunately that means the $30,000 is split between all of you. There are steps you can take to protect yourself from this situation right now. You could purchase comprehensive, collision, underinsured, uninsured and medical payments coverage for your car insurance policy. But, this problem is only getting worse for everyone. Thankfully, our state government is thinking about fixing it! The Arizona Senate just voted 19 to 11 for SB 1075 to raise the required minimum coverages to 25/50/25 liability. These would be the same coverages described above, but with increased limits. If the Arizona House of Representatives also passes a bill it will have the chance to become the new law. Here at Vrana Law Firm, we’re excited about the possibility that this law may go through. When we work with clients in car accidents, our goal is to make them whole after the accident. This includes getting your car repaired, finding you treatment to help you recover, and getting an injury settlement that covers your bills and compensates you for your injury. The biggest obstacle to this is often when the driver that hit you has minimum limits and you don’t have any underinsured coverage to help out. So, we will be calling our Arizona representatives to support this bill. If you’d like to help out, you could also call, email or write to your representative. Who are they? The state makes it easy to find out and contact them. That will give you some information on your representatives, including their office contact information. You could call them, email or write them an actual letter. Why would we not want minimums to go up? Well, if you’re buying the cheapest insurance possible, the cost of it could go up because you’re getting more coverage. Someone who’s barely getting by would be squeezed a little more. They might not want to be forced to pay for something they think they’ll never use. It’s the nature of our job, but we see far too often the effects of people driving without enough insurance. We recommend to everyone in our office to get a policy with comprehensive and collision coverage and at least 100/300/50 limits with 100/300 underinsured, 100/300 uninsured and $2,000 in medical payments coverage. We often talk to victims of hit and runs, drunk drivers and normal accidents where the medical bills drastically exceed the current minimums. To us, it’s a matter of personal responsibility to drive with a reasonable level of insurance coverage and the proposed increase gets us closer to that level. If you’d join us in contacting your representative to encourage this change, we’d appreciate it! Insurance is something we pay for but hope never to have to use. But if used, we hope that all those payments were made for a policy that will actually give the coverage needed.